The SECUNORM PRIMAX is a safety knife for right handers, still very popular today. The "little brother" of the SECUNORM IDEAL, uses a so called "Buegelklinge" with a low cutting depth - to protect your goods better. You can use it for all normal cutting jobs. Since it is light and handy, you can even work over long stretches without getting tired. Before you have to change the quality blade, you can turn it around once. This doubles the usage time of the blade - and reduces the energy you use up. Because your product cuts like new again. A new blade at the right time? No problem! Push the plastic insert out of the handle - and it can be easily changed. 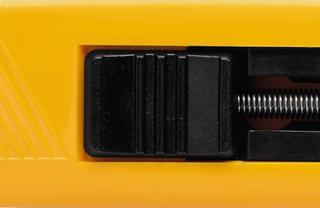 Two holding points on the blade carrier ensure more stability. When work causes you to sweat, you lose your grip? Not with the SECUNORM PRIMAX. 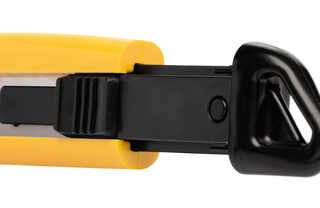 The grooves at the front of the handle reduce the risk of slipping and allow permanent and effective cutting. The eyelet of the SECUNORM PRIMAX also ensures successful completion. Simply pull a strap through it - and you can hang up your cutter safely without having to look for it later.